Earlier this evening I was in the City, checking out the latest Big Things, but this posting isn’t about that. I care just enough about England doing well in the World Cup to have to try not to care, as opposed to truly not caring. Countries like Tunisia are getting better at soccer, and countries like England are getting worse, so today’s game, Tunisia v England, was a banana skin almost guaranteed to embarrass England. I chose early this evening for my City walkabout because the weather forecast was good, but also because if I was photoing in the City, I could forget about this sure-to-be excruciating game. Fat chance. For starters, I was constantly walking past pubs full of people crying out in unison and in frustration, at England’s evidently imperfect performance. Also, I had my mobile phone with me, and it was able to tell me what the shouting was all about. I tried not to mind when Tunisia equalised with a penalty. I tried not even to know. But I did, because I did. 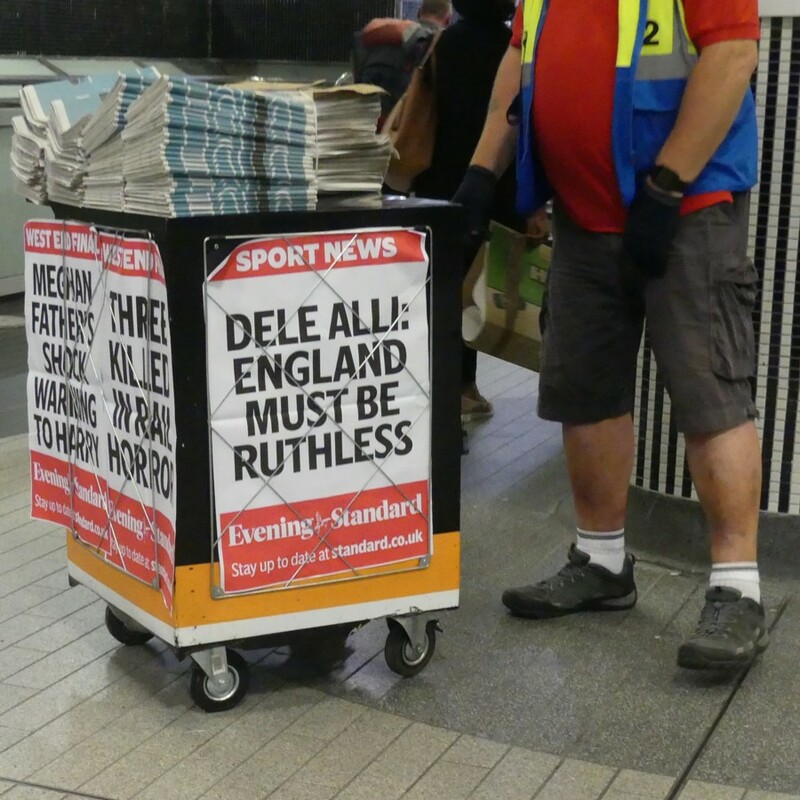 On the left, an Evening Standard headline, all about how ruthless England must be, against Tunisia. Sadly, they ruthlessly missed almost all of the many goal chances they created. Had that other Spurs player, Kane, not scored at the beginning, and then again right at the end in extra time, England would have been humiliated. 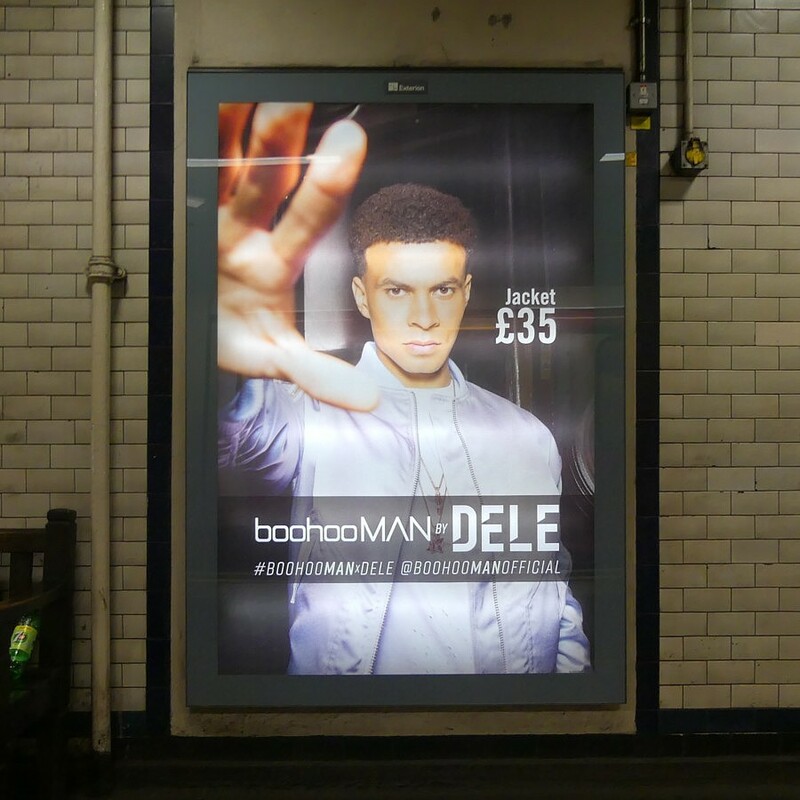 And on the right, an advertising campaign which Dele Alli was surely asking for trouble by agreeing to. 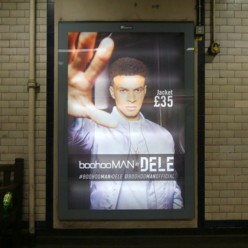 He is fronting for clothing brand boohoo MAN. This is a photocaption waiting to happen. When England fail to win the World Cup, and they will, quite soon, fail to win the World Cup, Dele Alli will be photoed, a lot, looking unhappy. And the unhappiest photo of all will have the words “boohoo man” under it, in many media outlets. This will greatly benefit boohoo, by getting its name talked about, so I suppose, come to think of it, that the prospect of such coverage has already greatly benefited Del Alli. But I consider this very undignified, even if Dele Alli is already boohooing all the way to the bank.